Yesterday kicked off the first day of the New York Locavore Challenge hosted by NOFA NY (The Northeast Organic Farming Association of New York). When I told Brad I thought we should sign up and was talking about the 250 mile diet, he said to me, “but don’t we already eat like that?” It’s true, we’re pretty much locavores by habit. We buy our food from the farmers at the Greenmarket and the Park Slope Food Coop. Save for some of the non-local things we can’t live without, like coffee, olive oil, lemons, and those tasty Marcona almonds, I know where (and how far) most of our food comes from, and in many cases I even know the people who grow it. It’s those people who I’ve been thinking about all week. 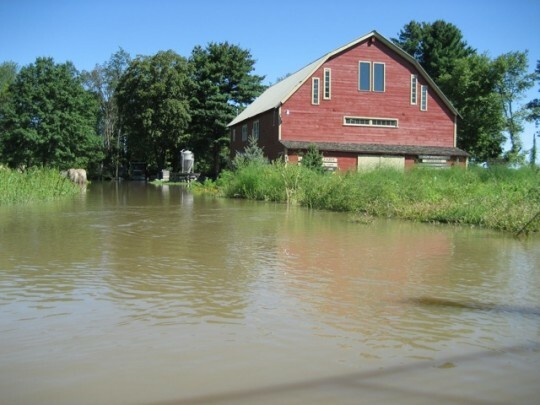 Hurricane Irene caused devestating floods to upstate New York, including the Hudson River Valley and the Catskills where many of the farms we buy from at Grand Army Plaza are located. And if you’ve been reading this blog, you’ll know that includes my friend Ray. When I learned that the storm danced around Brooklyn and settled in north of us causing rivers to overflow, there was cause for alarm. The report at the beginning of the week was that Ray lost everything. I hoped this was an exaggeration, that when the waters receded and the damage was assessed, that the loss would not be that bad. Sadly this was not the case. 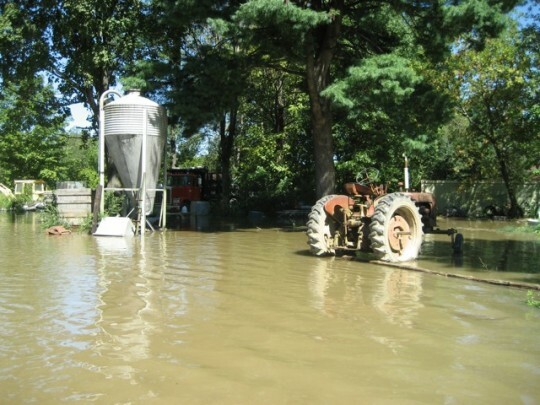 Over the course of this past week, my friend Etienne and I have been swapping articles, like this one in the New York Times, and this one in the Daily Freeman that talks about the flooding of Springtown road, where Ray and several other farmers who come to the NYC greenmarkets are located. Several of us in Brooklyn, feeling helpless and worried, waited for more word. On Wednesday and Thursday I started getting more detailed damage reports. 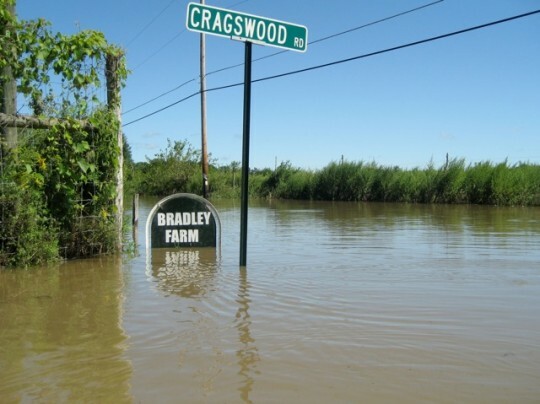 The weekly newsletter from Bradley Farm tried to highlight the positive – Ray’s pigs and most of his chickens survived the flood, and 300 lbs. of tomatoes were actively being turned into sauce. But then Ray’s friend Paul sent me photos and I read an email from his neighboring farmer, Kira, known as Evolutionary Organics at our local market, and the reality is that the level of loss is severe. 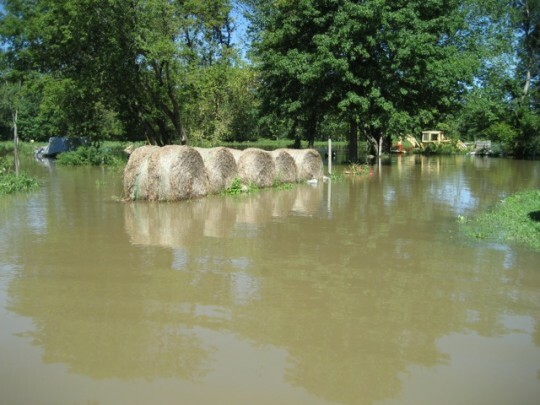 The flood caused fields to sit under as much as 6 feet of water (Ray was canoing over the land), many farmers have lost 90-100% of the season’s crops, and nobody knows just yet how they’ll get through the next few months. It’s the end of Summer – the middle of what should be the most bountiful harvest of the the season – the zucchini, tomatoes, corn and other crops we’ve been feasting on lately are just reaching their peak. The peppers and eggplants and all the late Summer produce that would normally be plentiful through the warmer days of Fall are finally hitting their stride. The fall crops like broccoli and tons of beautiful greens that were planted earlier this Summer are nearly ready. Soon the Fall and winter storage crops like winter squash and potatoes, which require a season’s worth of planning, should start making an appearance – these are especially important crops, because storage allows them to sustain us throughout our long, cold Northeast Winters. Now, here’s what you need to understand – all these crops are gone. Flooded out and in some cases washed away. Those that still stand are covered in silt and quickly becoming diseased from all the water and soggy soil. It’s too late in the season to start again, there just aren’t enough warm days left in the growing season. So the farmers will come to market and sell us what they harvested or stored before the storm, and maybe a few crops will make it and a few may be re-planted for Fall harvest, but it’s only a matter of time before they’re looking at empty fields, and down a long road to the next season wondering how they’re going to survive. Words can’t really express the concern I feel for these farmers. I am so grateful to have them in our lives and to be able to eat the food they grow. I wish it was as simple as encouraging you all to go out to the market tomorrow to support your local farmers (and yes, PLEASE do this! ), but unfortunately there will come a point when they have little to nothing to sell to us until next season (that means the remainder of Summer, Fall and Winter). How can we support them so they can support themselves after that? I wish I had the answer to that question, a lot of people do. Right now we can only wait and see, and rise to the occasion when it presents itself. And so I return to the Locavore Challenge. For me this is not so much a month of challenge as it is a month of awareness. A month to pay closer than usual attention to the food we eat and where it’s coming from. Can we replace some of our non-local ingredients with local ones? Can we support more people in our community who are working to bring us good food? Can we do it in new ways? 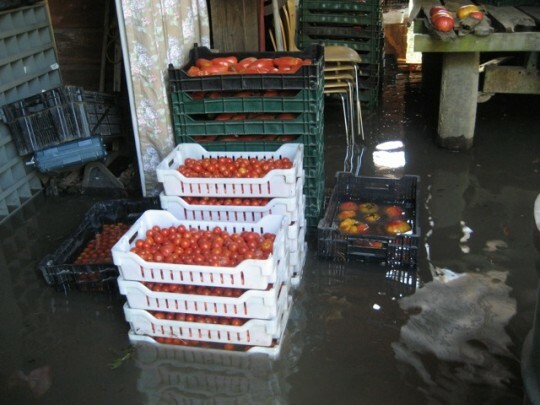 It will be an interesting month to ramp up our locavorism when many of our local food sources has been devastated, and I worry for the loss that we will all continue to feel in the months ahead. But for now, I’m lifting my chin and looking out. I’ll keep you posted. NOFA NY is a great organization that works to band together consumers, gardeners, and farmers working together to create a sustainable regional food system and make good food available to all people. Part of my pledge to the Locavore challenge is to spread the word. So I am encouraging you to like them on Facebook, follow them on Twitter, read their blog, and consider joining or simply making a donation to support their efforts. While you’re at it, check out Hudson Valley Harvest, another great organization supporting Hudson Valley farmers. Oh, and it’s not too late to join the challenge. Please tweet, like, and share this post with as many people as possible. I am so sorry for the loss these farmers, and so many others, have suffered. It’s devastating to a farmer to have all of their hard work go to waste. Farmers here are struggling with deer overpopulation. Many farmers have lost 100% of their crops to the deer. It’s a mess. We should all find ways to help out those farmers who lose everything so that they might once again be able to help us fill our tables. The good news is that there are many people wanting and waiting to help. Organization will take some time but is sure to happen.